IF IN EYES, RINSE WITH WATER FOR 15 MIN. IF SWALLOWED, DRINK WATER. CONTACT A POISON CONTROL CENTER OR DOCTOR IMMEDIATELY. DO NOT INDUCE VOMITING. Just switched from using cascade and these do an awesome job if not better than the leading brand. Iâ€™ve been converted! Great dishwashing tablets, I switched over from the other Method tabs and these work well, even for stuck-on egg yolk. We will buy them again. 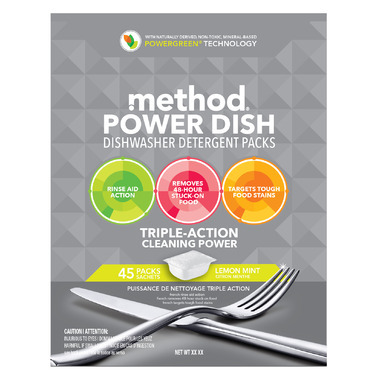 I'm a big fan of Method's Smarty Dish Plus so I decided to try these. They seem to get my regular plates clean enough but they leave a sticky white film all over my kid's plastic dishware. Not into it! Switching back to the other kind. I really like these dish tabs. They get all of the food gunk off - even 48 hour dirty dishes like the packaging says.